The last four days have been pretty bad. 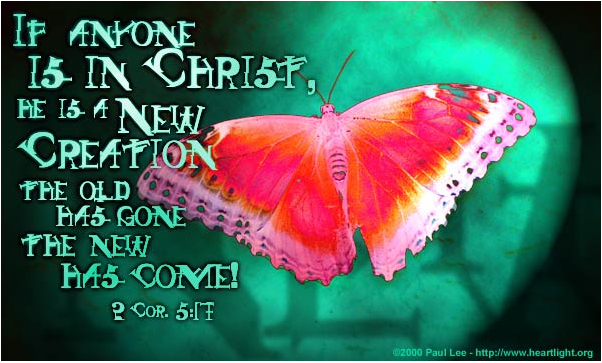 Therefore if anyone is in Christ, he is a new creature; the old things passed away; behold, new things have come. Now all these things are from God, who reconciled us to Himself through Christ and gave us the ministry of reconciliation, namely, that God was in Christ reconciling the world to Himself, not counting their trespasses against them, and He has committed to us the word of reconciliation. I love this passage. A good reminder for all of us. I read an article about addiction, a specific addiction that doesn't affect me, but there was one very valuable point in the article. See yourself as God sees you. Forgiven. God is a forgiving God, full of mercy! Hebrews 2:17 Wherefore in all things it behoved him to be made like unto his brethren, that he might be a merciful and faithful high priest in things pertaining to God to make reconciliation for the sins of the people. Christians are not perfect, honey, on forgiven. We are human, and He knows we will fall. Pick yourself up, start over again, and know that the Almighty loves you, and so do we! Sending hugs! Love ya! A wonderful thing about God is that he forgives those who ask for forgiveness and repent. Hope it gets better. Amy~ God chose David to be king over Israel b/c he knew that David was a man after God's own heart. Then when David fell into sin, it took the prophet Nathan to remind David that he had sinned and that it truly was a sin against God (not Bathsheba or Uriah). David's response, you'll remember, was true repentance. And he uttered that prayer of prayers, "Create in me a clean heart, O God, and renew a right spirit within me." Ps. 51:10. He also then asks God to renew the joy of his salvation. The point here is that we all can (and do) sin...but the repentant heart is always welcomed back and forgiven. I am praying for your joy to be restored! I am sure when you look back it won't be as bad as you think. Fortunately, as you well know, it is not what you think that matters most.